Reduce cost and complexity when it is time to upgrade or expand your backup or disaster recovery hardware infrastructure. Learn how to eliminate the time and effort of installing, configuring, and maintaining your backup and disaster recovery hardware and software components with the Veritas NetBackup™ Appliance. 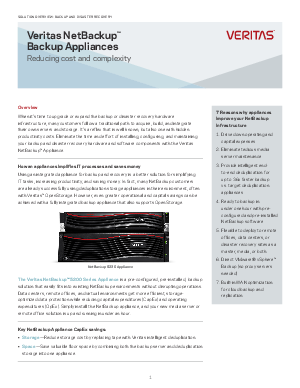 Read the 7 reasons why appliances can improve your NetBackup infrastructure.